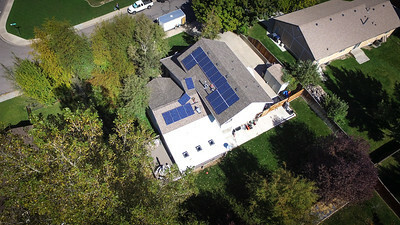 2016-10-04 – They installed our solar panels today and near the end of the installation I took my drone up and shot this arial view. We needed 21 panels and they have two left to put in place. This should be enough to cover our power bill for the rest of the years we remain in this home. Less expensive on a monthly average than our power bill and they are paid off in 15 year. They have a 25 year warranty on them so I think we're good.